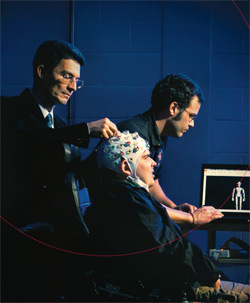 BioE affiliate professor José Contreras-Vidal (Department of Kinesiology, standing at left) working with graduate students Steven Graff (BioE, seated) and Alessandro Presacco (Department of Kinesiology, background) on a noninvasive brain-computer interface that could soon control sophisticated prosthetic devices. Photo by John Consoli. Groundbreaking research that decodes the brain signals behind physical activity and uses them to control devices such as computers and prosthetics is featured on the cover of the latest issue of Terp, the University of Maryland's alumni magazine. The work, spearheaded by Fischell Department of Bioengineering (BioE) affiliate professor José Contreras-Vidal (Department of Kinesiology), also involves past and present BioE graduate students, including Trent Bradberry (Ph.D. '10), Steven Graff (B.S. '10, bioengineering), and Kimberly Kontson. In 2010, Contreras-Vidal and Bradberry were the first to publish research demonstrating that brain activity recorded using noninvasive electroencephalography (EEG) could be used to reconstruct hand movements. Their findings were significant because they could pave the way for safe, thought-controlled devices that do not require the user to have a surgical implant. 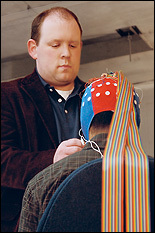 Contreras-Vidal's brain-computer interface could also be used to rehabilitate or assist people who have lost motor control due to an injury, following a stroke, or, as in Graff's case, live with a disorder such as muscular dystrophy. The Terp feature story, "Think. Move. Live," describes the group's latest efforts, which include matching EEG data to specific movements and motor-sensory control points in realtime, and a collaboration with a team at the Johns Hopkins Applied Physics Laboratory developing the next generation of robotic arms.